TEST YOUR STRENGTH TO MAKE IT TO THE TOP! 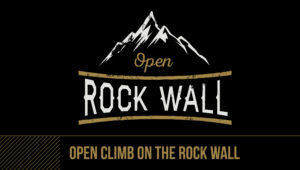 The Rock Wall at Arden Hills will be available for an open climb on select Saturdays. During the Open Climb a staff member will be present for the duration of the climb. However, parents must be present. Come and have fun! COMPLIMENTARY * RSVP below to attend* Exclusive for Members only. Ages 5 and over.